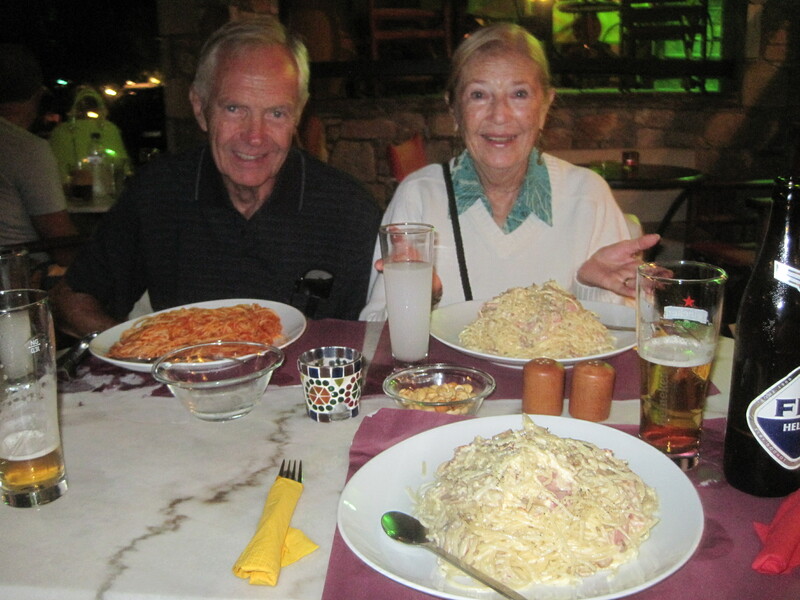 During our 2011 trip to Alonnisos we heard from several friends and from my in-laws as well, that we really needed to have a meal at the Helios Restaurant & Bar in the port town of Patitiri. They essentially raved about the quality of the food prepared there, and also remarked about the diverse nature of the menu. We eventually made it to Helios during the final week of our trip, and I must say that our dining experience there actually exceeded our expectations. The food was simply excellent in every respect and despite the fact that every table was filled, the service was quite solid that night as well. Helios is also affectionately known by its regular customers as “Andy’s Bar” in honor of the owner and chef. Originating from Berlin, Andy (pictured to your right) is a professional chef who has extensive experience in preparing a wide range of gourmet dishes. My dear friend from Thessaloniki, “Ilias the Waiter,” tells me that Andy spent four years in a top quality cooking school, and he also worked for several years as a chef in Italy prior to finding his way to Greece. The night we visited Helios I ordered a Chicken Caesar Wrap that was perfectly prepared, and Andrea had a pasta dish that she greatly enjoyed. I don’t recall what my in-laws ate that evening, but I do remember they, too, were very satisfied with their meals. Unfortunately, I also cannot recall the specifics of the menu, but I do know there were appetizers, salads, and entrees that (to my knowledge) are not available anywhere else on the island. That makes Helios a great alternative restaurant to dine at should you be ready to eat something beyond traditional Greek faire. Helios also features a wide assortment of wines, beer, and hard liquor, and liqueurs. So, even if you’re not ready for a meal it’s worth your time to stop by and have a cocktail, or perhaps a coffee drink or some other beverage. Helios is located directly above the port of Patiri as you stand at point where the Port Police office is located in the center of the harbor. The restaurant is accessible from a set of steps on either road leading up from the port itself (the road is like a horseshoe, with the bottom of the shoe being the port). Note: We returned to Helios twice during our trip in the summer of 2014, and once again during 2016 and again found the food to be excellent! 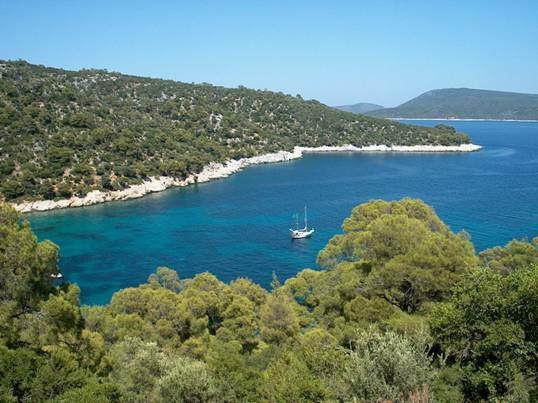 Lefto Gialos Beach is located on a beautiful bay surrounded by rugged, hilly terrain, it’s undoubtedly one of the best beaches for swimming on the island. It’s also a fairly large beach and there are numerous beach chairs and umbrellas for rent. Like most beaches on the island, Lefto Gialos is comprised of stones as opposed to sand, but unlike many others, the stones are for the most part consistently whitish in tone and are more round than flat (see photo to your left). That means for optimum comfort you’ll either need to rent a beach chair (around 12 Euros with umbrella), use a heavy-duty beach mat, or have an air mattress (lie-low in the UK) to lie on. To see a brief YouTube video that shows the type of view you’ll get to experience at this lovely beach click here. 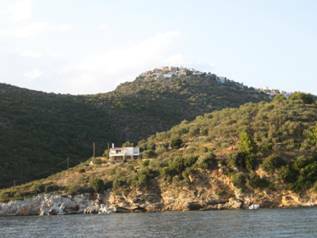 Lefto Gialos is located perhaps eight kilometers from the port town of Patitiri, and 11 kilometers from the Old Village. Because of this distance, walking there would be quite challenging for most people, so that means you’ll most likely need to either rent a motorbike or a car to get there, or take a taxi. The drive offers some very nice scenery on the way, including a gorgeous view of another beach called Tzortzi Gialos (see photo to your right), and the road is paved and very smooth for the most part. When we initially visited this beach back in 1997 it was a lot different than it is today. The road wasn’t paved and in spots was very rough-going. In addition, there was just one restaurant, and its source of electricity was a gas-powered generator because power lines had not yet been extended to that area of the island. Back then it was so rustic there was a goat herder who regularly brought his flock down from the hills to drink water from a trough located right on the upper portion of the beach. I’ll never forget one day when I was lying on the beach almost asleep and I heard the sound of many ringing bells. I opened my eyes and was surrounded by perhaps 50 goats! Don’t worry though, the goats are no longer brought down to that area to drink. Currently there are two restaurants at Lefto Gialos, and each of them has its own charm and following. 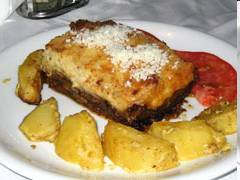 We are particularly fond of the Eleonas Estiatorio because the food and service is always excellent, and, we have personally known the owners, Nikos and Magda, and their family, for nearly 20 years. 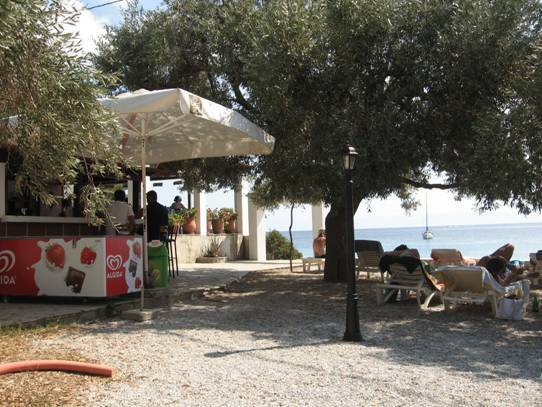 Eleonas is the restaurant on your right when you arrive at Lefto Gialos beach. The original estiatorio there, it’s located in the midst of an olive tree grove and in addition to the shade offered by the trees it offers thatched umbrellas to protect diners from the very hot Mediterranean sun. When we initially met Nikos and Magda in 1997, they treated us with very genuine filoxenia (Greek for hospitality), and each time we return we are treated like family. 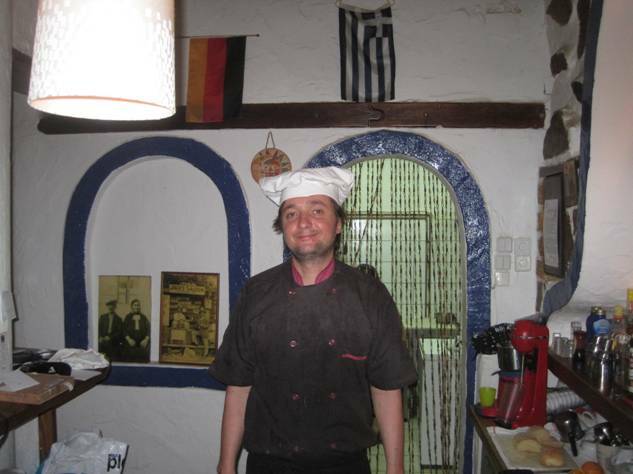 Nikos has also been very helpful to me in my feeble attempts at learning to speak Greek, often instructing me in the midst of serving our food! 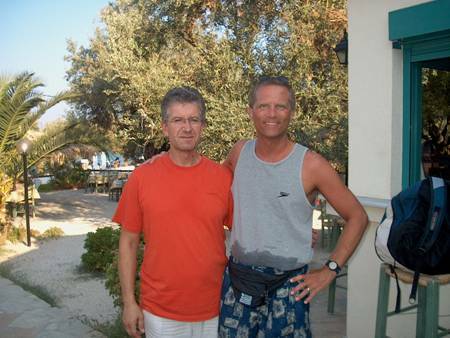 (photo to your left is of Nikos and me a few years ago). During the busiest part of the tourist season Eleonas is always filled with customers, but even so we usually are able to get a table fairly quickly. If by chance you do have to wait for a spell, rest assured that your meals will be well worth the wait. Open for lunch and dinner, Eleonas has a very large assortment of menu items, including numerous hot & cold appetizers and salads that can serve as meals all by themselves. With respect to the entrees, we’ve always found anything they make in the oven to be very delicious. When artichokes are in season they include them along with potatoes in a couple of dishes using a wonderfully tasty sauce, and Eleonas also offers a full range of traditional Greek cuisine. There is usually an excellent selection of both fresh and frozen fish, and shellfish as well. Desserts are likewise available, as are a selection of aperitifs, coffee and tea as well. While not a daily menu item, one very sweet treat that Eleonas makes occasionally is called “fuskakia,” or “little blisters,” which are little balls of dough deep-fried and then sweetened with honey, and I believe a bit of cinnamon flavor as well. Trust me; it’s impossible to eat just one of them! While not right on the water, the Eleonas Estiatorio offers a view of the beach and is located approximately 50 meters from the sea. 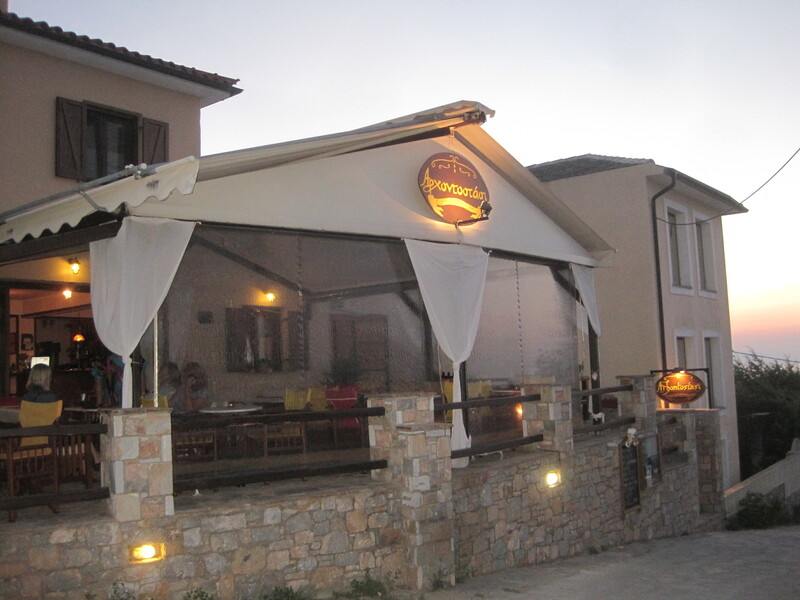 While most of the business is done during the day, Eleonas is also open in the evening. The peaceful location always makes dining there a very enjoyable experience. 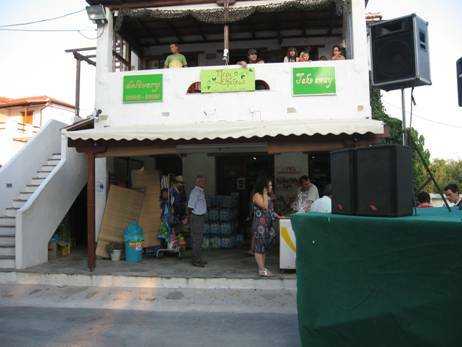 Please also note that during 2009 Eleonas added a cafe/bar located nearer the water that offers a wide selection of drinks, as well as snack-type food entrees. Should you visit Eleonas please do give our regards to Nikos and Magda, and tell them that Jeff & Andrea from Chicago sent you! To learn more about Eleonas, visit their website in English, or in Greek. Megalos Mourtias is the closest beach to the Old Village of Alonninsos that offers full services (i.e., food and drink, restrooms, beach chair and umbrella rental). There are actually two tavernas at Megalos Mourtias, and each has it own charm and following. Since this beach is just a couple of kilometers away from the home we typically use during our stays, we tend to spend most of our swimming and beach time there. In fact, it’s only a very rare day that we don’t spend some time lounging around the beach at Megalos Mourtias. Over the years more often than not we tend to walk down to this beach since it only takes 20 – 25 minutes from the house we use. But, that’s the easy part of course, as based on your fitness level and the number of beers or cocktails you may have consumed at the taverna, the walk back up to the village can be quite challenging! The photo to your left gives you a clear idea of just how steep that walk back to the Old Village actually is, though it does overstate it a bit since both the road and the path provide a more gradual ascent. Megalos Mourtias, like most beaches on Alonnisos, is a stone beach as opposed to sand. So when visiting this type of beach we strongly advise that you purchase some “water socks” since walking on the stones can be quite uncomfortable. If you don’t want to leave them on while swimming once you’re in the water You can always toss them back toward your beach chair or towel. Speaking of the stones, while using a beach towel on top of them is an option that many take, it is very difficult to remain comfortable lying on them for long periods of time. In our case we bring air mattresses (or a lie-low if you’re from the UK) and put our towels on top of them. The added advantage of the lie-low obviously is that you can take it out into the water and enjoy the feeling of floating on the sea as the current moves you back and forth. 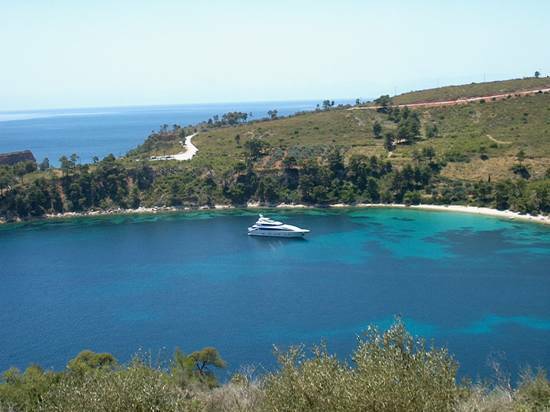 This is perhaps my favorite activity in Alonnisos! On the other hand, if you’re not up for blowing up the lie-low then you can always rent a couple of lounge chairs and an umbrella. One word of caution when you begin to carve out your place on the beach is that you must be aware that when a large ferry passes by, even one a couple kilometers or more out into the sea, eventually some very large waves that were generated by the ship’s wake make their way to shore. When that happens, if you have set your towel, chair or lie-low too close to the water’s edge you are definitely going to get wet! It’s actually quite comical to watch this happen to unsuspecting newcomers, as it always results in a scramble to higher ground. 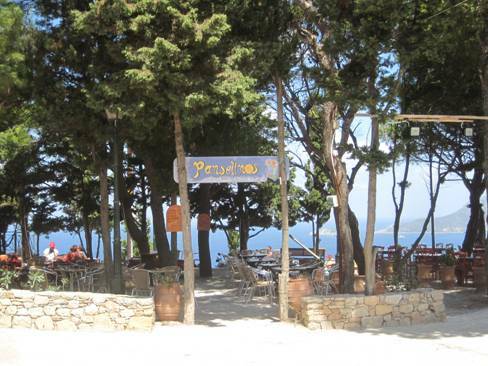 The Megalo Mourtia Taverna (entrance from the beach is shown to your left) is our favorite taverna on the beach. 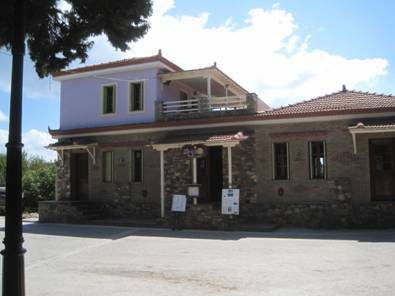 It is owned and operated by a wonderful couple, Yiannis & Ria, who are assisted by their children Kelly and Dimitris, as well as various other family members. We first met Yiannis & Ria (pictured to your right along with Kelly and Dimitris) back in 2006 after being invited to a private party at the taverna one evening. We had never visited their place prior to that night, but once we had an opportunity to get to know them and sample their great food, we were hooked. 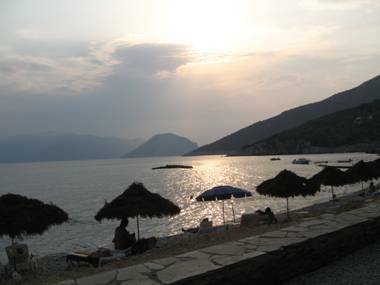 From that evening on, whenever we head down to Megalos Mourtias we always find a spot on the beach near their taverna and often eat lunch or a snack there as well. Ria is not of Greek descent but she has lived in Greece for so long that she is exceptionally fluent in the Greek language, and even teaches Greek to foreigners during the off-season. Both Yiannis and Ria have always been very hospitable to us. 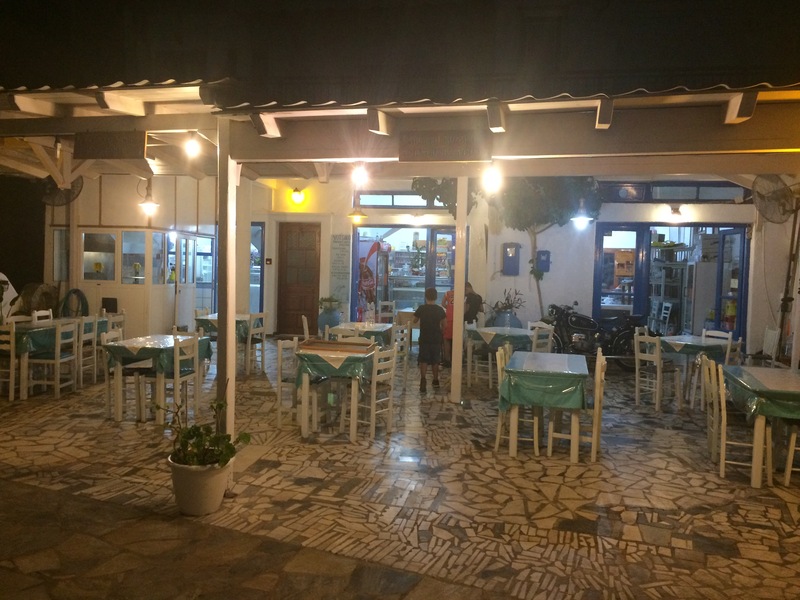 Besides us, there is also a core group of foreigners who own homes on the island that frequent this taverna, so it’s very common to see the same smiling faces milling about on a daily basis. In addition to the great food and service, there’s two other benefits to eating at the Megalo Mourtia Taverna. First, it qualifies you to use (for no charge) one of their lounge chairs (subject to availability) that are located on the same level as the restaurant and some that are on the beach in front of the restaurant property as well. If you can land on the level of the restaurant chair you have the choice of being directly in the sun,or lying underneath one of the lovely olive trees on the property (see picture to your left). The second benefit is the ability to park a rental car on the property when space permits (get there early!). Open for lunch and dinner meals, the Megalo Mourtia Taverna has broad menu that includes both hot and cold appetizers and a full range of fresh salads as well. 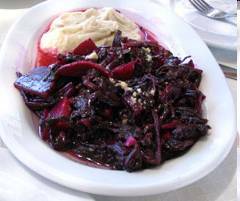 Their Beet Salad (with garlic) appetizer is by far our favorite, and we also enjoy their appetizer sampler, which includes a number of the cold appetizers on a single platter for a very nice price. As for entrees, I recommend you try their Swordfish Souvlaki, Dizzy Chicken, or the Stuffed Mushrooms, but the fact is everything else they offer is very tasty as well. Finally, Yiannis & Ria usually have a excellent selection of fresh fish and shellfish as well. The view of the sea from the Megalo Mourtia Taverna is, for the most part, unobstructed when seated at most of the tables. During the day it can get quite busy, but Yiannis & Ria always do their best to make sure customers are served as promptly as possible. If you ever do experience a problem, Ria, as the primary server, will be certain to take care of it with a smile. 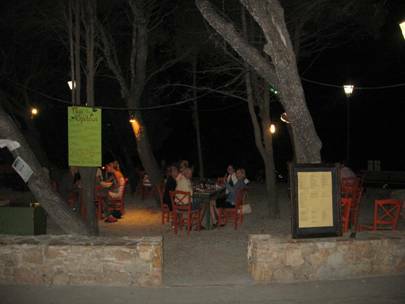 While most of the business is done during the day, the taverna is open for business at night, and the sound of the waves coming up on the shore combined with the sweet scent of the sea make having dinner there a very enjoyable experience. We celebrated my birthday here with a dinner one time and it was a wonderful experience in every respect. From our experience, eating (or drinking ) at this establishment is like sitting down with good friends. 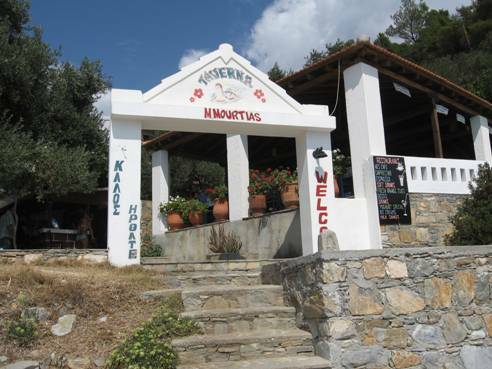 The combination of good food and solid service makes this taverna one that you will want to return to whenever you visit the beach at Megalos Mourtias. When you do visit, please do give our regards to Yiannis & Ria, and tell them Jeff and Andrea sent you! As for the atmosphere of the beach itself, Megalos Mourtias has always been one of my favorites on the island. There’s just something about the view toward the neighboring island of Skopelos as the sun is fading that really touches my heart. In fact, I was so moved by it, that in 2003 I asked the artist who was working on the artwork for my first book (Spirituality Simplified) to use a series of digital photos taken from this beach as the foundation for the cover graphic (see picture to your right). The port town of Patitiri abounds with restaurants and tavernas, so many that it really is a challenge to visit them all, even if you’ll be on the island for a fortnight or more. In our many trips to Alonnisos we’ve never tried to sample the offerings of numerous restaurants, but have instead adopted the approach of frequenting those establishments that we already “know” serve great food and provide excellent service. 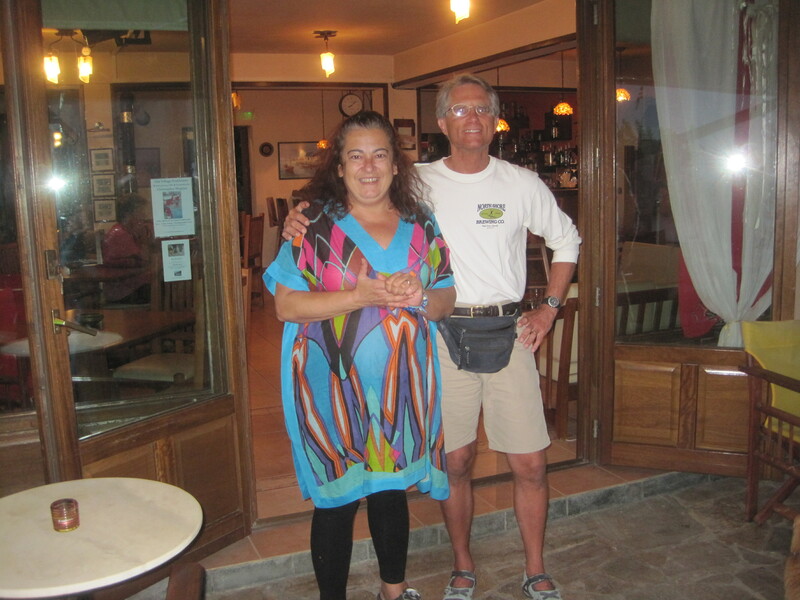 There are a few Patitiri restaurants in particular that we visit on a regular basis, and in this post I’ll focus on the Akrogiali Estiatorio, which is owned and operated by Pasxalis Diniakos and his wife, Eleni (pictured to your right). The restaurant was originally run by his mother, Nina, so Pasxalis grew up in the business and really knows how to properly manage a restaurant. This is clearly evidenced by the fact that it’s very rare to find an empty table at the Akrogiali, and in the high season you’d be wise to get there before 8:30 p.m. or you’ll definitely have to wait to be seated. Even with such popularity, however, you won’t find Pasxalis making any overt attempt to speed you out of his restaurant so he can seat the next customers. In my experience this is because he really does believe in practicing “filoxenia” (Greek, for hospitality), and wants you to be completely satisfied with your dining experience. Every since the first time we ate there in 2000 we’ve been warmly welcomed and that exceptional treatment combined with the delicious food served there makes Akrogiali a place to return to again and again. Open for lunch and dinner meals, the Akrogiali has a good-size menu that includes both hot and cold appetizers, and a full range of fresh salads as well. Their Skordalia (garlic spread) is always freshly prepared, as is their Meletzana Salata (eggplant spread), which is in our view the best on the island. 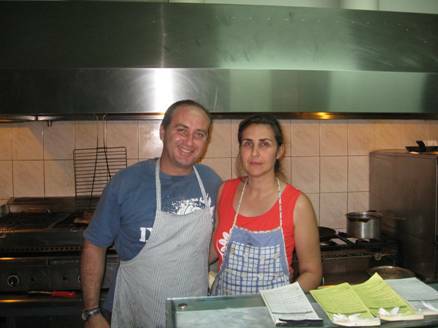 As for entrees, Eleni makes fantastic oven-baked dishes such as Moussakas, Lemon Chicken, and Lamb Kleftiko. Pasxalis is also quite adept on the grill, making some of the best Souvlakia (kebobs) you’ll find, as well as tasty lamb chops and pork chops. It is in the seafood arena that Pasxalis really shines, as he always has a tremendous selection of both fresh and frozen fish, as well as a broad assortment of shellfish. My mother-in-law Elaine is particularly fond of the steamed Mussells in Wine dish, their Atharina (see photo to your left), and also their Shrimp Saganaki. 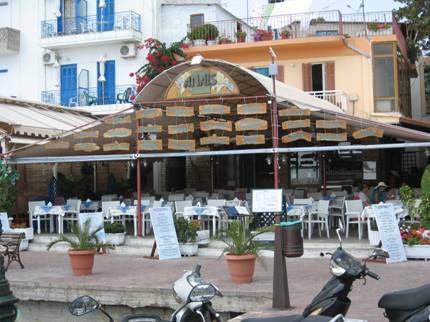 The Akrogiali Estiatorio is located right on the waterfront in Patitiri, so it provides an excellent view of the harbor. In the evening it becomes a very lively place, with loads of people walking down the promenade checking out the sights and trying to decide where to eat. 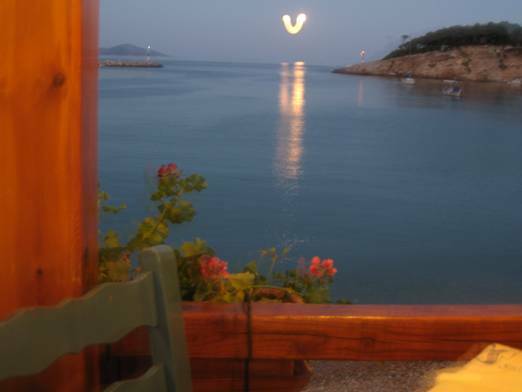 The picture to your right, which Andrea took from our table on the evening of a full moon, gives you a good idea of the view this restaurant offers. The Akrogiali seats perhaps 30 – 40 patrons at a time, which makes it more of a “personal” place than other, larger restaurants on the island. Should you take our advice and visit this wonderful estiatorio, please do ask for Pasxalis and tell him Jeff & Andrea from Chicago sent you! You won’t regret your decision to have a meal there, and my guess is, you’ll want to go back again and again.